Every year, swans migrate to warmer climates. However, someone has enchanted this mosaic art so that it turns any space into the coveted-land for these white darlings. 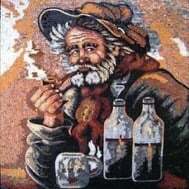 PROs: Handmade tile mosaic art composed of natural marble that is guaranteed to transform your space. Mosaicist: Mo AR. CONs: You may forget to bundle up in winter.